In early summer, Shelly & Sands Inc., Zanesville, OH, completely reconstructed over nine miles of I-71 between Mansfield and Columbus in the central part of Ohio. 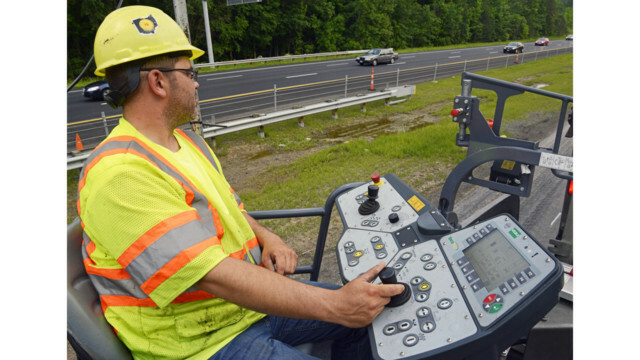 In a $54 million project, the Ohio DOT took the opportunity of widening I-71 from two lanes to three to completely rebuild the highway from the base up. This project represents the last stage of “three-laning” the busy interstate from Columbus to Cleveland, and the segment between Columbus and Cincinnati also is being widened to three lanes. 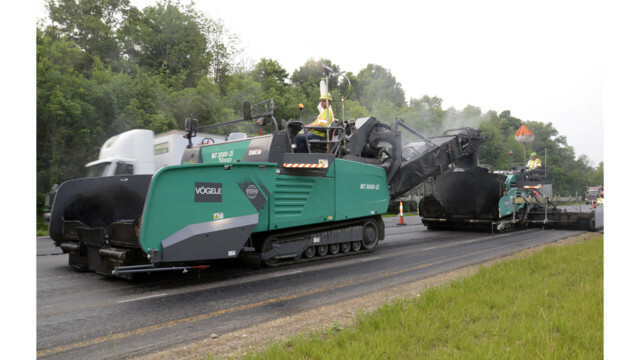 The star of the show on I-71 was Shelly & Sand’s new Vögele MT 3000-2i material transfer vehicle, feeding a Vision 5200-2 paver with VF 600 screed. The compact low-center-of-gravity MTV offers an alternative to the “silo” or shuttle-type MTVs which have been the standard up to now most states and to existing low-profile MTVs. The MT 3000-2i fed an innovative hopper insert mounted in the hopper of a Vision 5200-2 paver with VF 600 screed, both from Vögele. 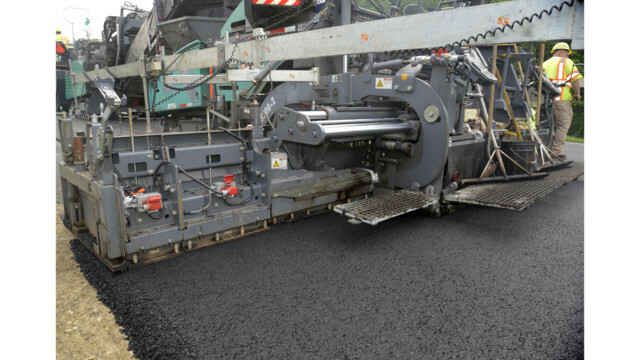 The VF 600 is a front-mount screed designed for main line paving. The paver operates with the Niveltronic Plus leveling system from Vögele, and Shelly & Sands has settled on that system. For smooth mats, both high frequency and exclusive Hamm Oscillation compaction figured into the job: breakdown compaction was provided by a Hamm HD+ 120i VV HF roller, intermediate compaction by a Hamm HD+ 110i VV HF roller, and finish compaction by an HD+ 120i VO with vibration compaction in the front, and Oscillation in the rear. Shelly & Sands’ long-time equipment distributor is The McLean Company. 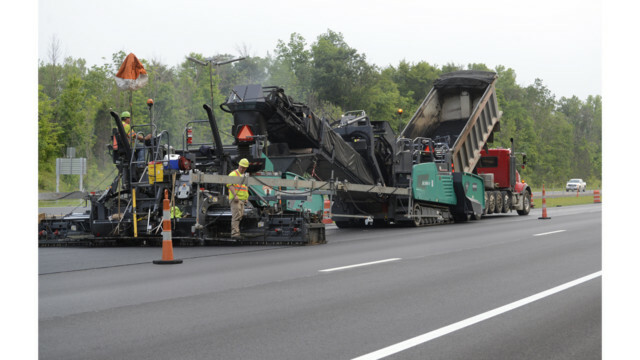 To begin, 9 inches of aged asphalt was milled by milling subcontractor BOCA Construction Inc., Norwalk, OH, from the existing two-lanes, both north- and southbound, revealing an original concrete pavement. In the meantime, the underlying stone base was removed. 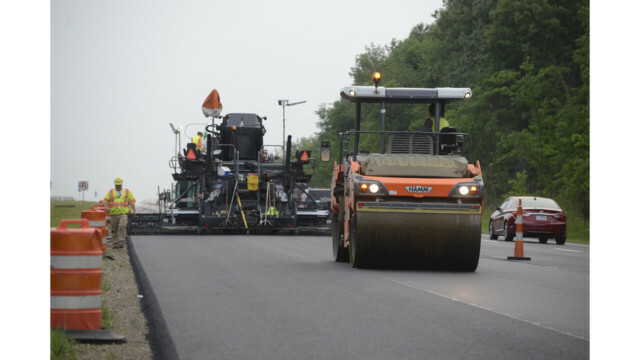 A 10-in.-deep cement-treated base was created by the Cleveland area-based subcontractor Cem-Base Inc., using two Wirtgen WR 2500s. A virgin aggregate base of 6 in. was placed on the CTB, topped by an 11-in. base course of PG 64-22 binder with NMAS of 1½ in., placed in two lifts of 6 and 5 in. This was followed by 1¾ inches of a 9 mm intermediate lift with PG 64-28 binder, and topped with 1½-in. of 12 mm surface course using a PG 70-22 binder containing SBS polymer modifer, blended at Shelly & Sands’ own terminal. For wide paving like on I-71, the VF 600 screed with bolt-on extensions was used, and that offered advantages to Shelly & Sands. “We made the right choice with that screed,” says Shelly & Sands’ Steve Schlosser, equipment superintendent. “It’s working out well, and the feedback from the group is positive. In fact, of all of Shelly & Sands’ screeds, only two are rear-mount. The contractor finds that while rear-mount screeds may be ideal for long-pull highway work, they are less manageable in tight urban quarters, and material management issues can develop as the screed is brought in, causing the screed to rise. At the start of the project, the contractor found the VF 600 was easier to set up than virtually any other of its screeds. The Vision 5200-2 used on this project is one of 23 Vögele pavers owned by Shelly & Sands. The firm also owns 36 Hamm rollers. “The Wirtgen Group, along with The McLean Company, has proven themselves over time with us,” Schlosser says. “We expect good bonus money because of Jake Christina’s crew, plus the hard work of Chad Evans’ Mar-Zane Plant 12. The combination of our good people, good equipment, dealer and factory support has helped this project. Some 624,984 sq. yds. of pavement will have been placed by the end of the project in June. 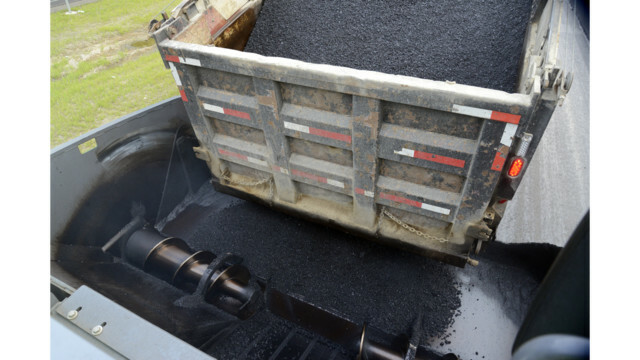 According to the new National Cooperative Highway Research Program synthesis, NCHRP 477, Methods and Practices on Reduction and Elimination of Asphalt Mix Segregation (2015, Google “NCHRP Synthesis 477”), end-of-truck segregation is one of three types of material segregation that can result in coarse mat finishes.